This will be the first doorbell that is compatible with Apple's HomeKit. France-based company Netatmo has revealed its Smart Video Doorbell, which lets consumers know who is at their door at any time via video calling, even if they’re not home. The company showcased the doorbell at CES in Las Vegas, and it will be the first smart doorbell that’s compatible with HomeKit, Apple’s smart home platform. At the show the doorbell won an accolade in the Home Appliances category during the CES 2019 Innovation Awards. The doorbell is small and sleek, and users will easily be able to set up the device by removing their existing doorbell and connecting the new one. Users will also need to connect the device to their home Wi-Fi for it to function. 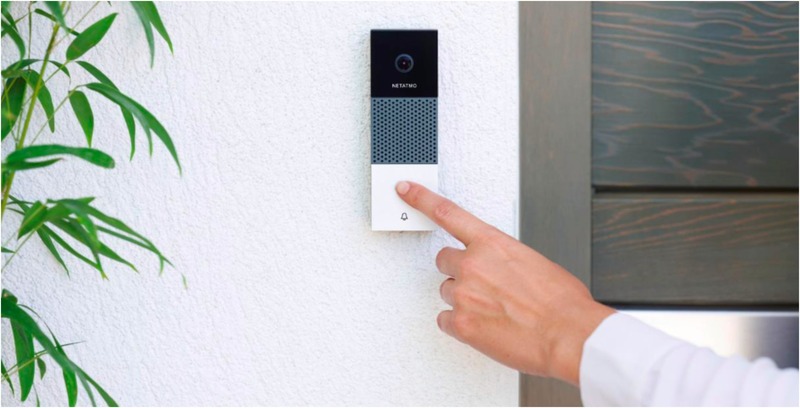 Netatmo explains that when someone comes to their home and rings the doorbell, they’ll receive a video call on their smartphone wherever they are, allowing them to talk to their visitor. The video call can be streamed on your iPhone or iPad, and there is no cloud storage, Netatmo says. The company notes that the device is compatible with an SD card in order to store video calls that can manually be deleted. The product is also designed with artificial intelligence technology so that only human faces are detected, Netatmo says, adding that random movements like clouds or leaves won’t trigger alerts. The Smart Door Bell can be used as a security alert device, according to Netatmo. The company says that if a burglar is present, the user will receive a notification and video recording. “The Smart Video Doorbell is an ideal way to never miss a visitor of a package. It is also the best response to the growing need for solutions to secure the home entrance,” said Netatmo’s CEO Fred Potter in a recent press release. “We have designed the Smart Video Doorbell in compliance with essential principles to guarantee the best smart home experience possible: it’s a useful and reliable product with thoughtful notifications, which ensures our users’ data protection and without planned obsolescence,” said Potter. Netatmo says the product will be available soon to consumers in the second half of 2019 and will be priced between $250 and $300 USD ($336 to $400 CAD). Canadian pricing has not yet been revealed but this story will be updated with the information when it becomes available.